HeadCount organizes “Participation Row” social-action villages and charity auctions at major live music events including LOCKN’, Newport Folk Festival ®, Okeechobee Music Festival and Dead & Co.’s tours. Participation Row has involved over 50 non-profit organizations and raised over $1 million for various charities. Partners include D’Angelico Guitars, Ben & Jerry’s KEEN, Qello Concerts and REVERB. HeadCount partnered with March for Our Lives to manage on-the-ground voter registration at 30 marches, including the flagship event in Washington D.C. on March 24th, 2018. HeadCount also led the largest voter registration training on record, with more then 400 volunteers. Through these efforts, more than 5,000 voters were registered in a single afternoon, including 1,552 in Washington alone. This was the highest total for a single event in HeadCount’s history. Connecting music and community activism, HeadCount partnered with The Capitol Theatre in Port Chester, NY to send school teachers to the Rock and Roll Hall of Fame and Museum every summer. The teachers receive cirriculum training on how to bring rock and roll history into their classrooms, with a focus on the history of music and activism. The program has been managed by HeadCount since 2013. #SoundOff is HeadCount’s online platform that makes it easy to tweet directly @ Congress. It gives individuals and advocacy organizations an easy way to use social media to create a public dialogue with lawmakers — driving legislators to respond less to special interests and more to the people who elected them. Visit www.soundoffatcongress.org and #SoundOff today. We installed solar panels at and elementary school via “The Bisco Power Mission,” a unique partnership with the band The Disco Biscuits (whose bass player, Marc Brownstein, is HeadCount’s co-founder). The band played a special benefit concert at the Brooklyn Bowl, and proceeds went toward the first solar panel installation at a public school in Philadelphia. HeadCount helped create a national holiday for voter registration, now endorsed by the Association of Secretary of States and involving more than 2,000 partner organizations. Over 500 musicians, comedians, and celebrities (including Dave Matthews, Pearl Jam, 50 Cent, Stephen Colbert and John Legend) have been photographed holding HeadCount “Register to Vote” clipboards, and then posted their photos via social media. We’ve already registered more then 50,000 voters through National Voter Registration Day, which also sees our volunteers hit the streets to register voters across the country. Our network TV public service announcements starring Jay-Z, Dave Matthews, and members of Phish and the Grateful Dead appeared on The Late Show with David Letterman, TNT, TBS, BET, Fuse and MSNBC. We’ve produced original Webcasts and concerts such as “The Bridge Session,” which paired Bob Weir and members of The National for the first time (they later recorded an album together). 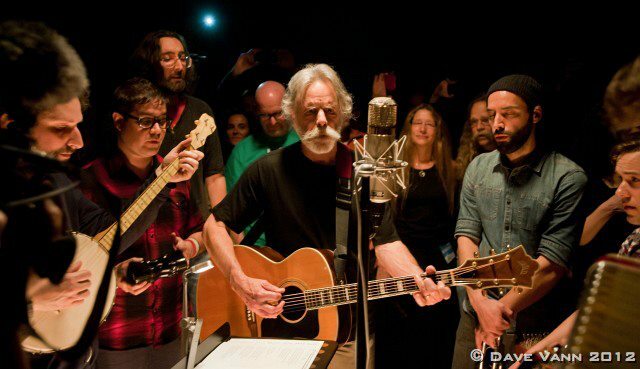 Weir also appeared at our 10th Anniversary concert with John Popper, Nels Cline and many others. More recently, HeadCount brought together musicians to score a live “Soundtrack to History” as the 2016 presidential election results unfolded. The “Music for Action” climate change campaign generated 100,000 emails to Congress by giving away a free “Best of Bonnaroo” compilation album with exclusive tracks from Pearl Jam, Wilco, Dave Matthews Band, Death Cab for Cutie, My Morning Jacket and a dozen others. Another version of “Music for Action,” created on behalf of the bands Dispatch and State Radio, won a Davey Award for Web-based activism. Our “Signs of the Times” photo contest involved thousands of fans and dozens of musicians taking to Facebook to speak their minds. It was the first of many successful photo campaigns staged by HeadCount. One issue that has the power to turn out voters is cannabis legalization. So HeadCount created a special non-partisan website – CannabisVoter.info – to educate voters on relevant ballot initiatives and where elected officials stand. The site, launched in Spring 2018, also includes special merchandise and links to various organizations and media outlets.